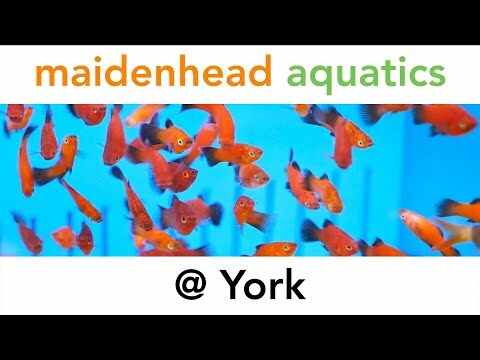 Maidenhead Aquatics at York is a well-established store stocking a large range of aquarium and water gardening products for both the established fishkeeper and first time hobbyist. With over 100 tropical tanks stocked with an incredible range of species, you’re sure to find something to tempt you. We stock everything from the classic neon tetra and colourful guppy to stunning cichlids, weird and wonderful shrimps and snails and "L-number" plecs, and we always have some unusual "oddballs". Fancy goldfish are well catered for and we stock a range of temperate species to suit all sizes of aquarium. Our pond section is home to a huge variety of pond marginal plants, lilies, floating and oxygenating plants. We have a wide range of pond fish always in stock in our purpose built koi-house; here you will find goldfish, comets, shubunkins, koi in a range of sizes, sterlets and many, many more. With a fantastic range of products at great value and friendly expert staff to offer advice, Maidenhead Aquatics at York has everything you need to make your hobby a success!